Today is the day, we have restrained we have resisted but today is indeed the day for flood gates to open and drown us in wine; what a delightful image. Our driver arrives bang on time and we head off to pick up the girls and get going into a day of indulgent wine, food and laughs; all things good for the soul if not for the liver. And it seems that girls travel with a slightly different slant on wardrobe than boys do, we are feeling a little under dressed. Our temporary girlfriends are set for a day at the races, pushing for a podium spot for fashion in the field. Striding confidently through dappled light, glowing smiles and relaxed posture complimented by bouncing hair and killer summer fashion; so hot they could totally be girls in a tampon commercial. Cindy Lauper plays somewhere in the background I am sure, girls just wanna have fun. The atmosphere is definitely set. We’re not looking all that shabby either if somewhat a little more informal as we load up into our late model Chevrolet and roll into the land of goodness. The energy in the car is up with no sign of the food comas from yesterday with our driver trying his best to value add on a tour style list of information. We largely plunge into a good natured conversation of our own but one interesting slant is a rundown on the canal system of Mendoza. This shady city is otherwise a desert with none of the many plane trees or any other trees we see everywhere native to this region, every single one is planted. This along with the wine region and the city itself hinges nearly entirely upon a complex canal system that runs from trapped snowmelt off the Andes. This whole system is gravity fed with only simple weirs and gates to govern its entire flow, a relic originating from civilisations centuries old. The complexity of this system belies its all too humble appearance, a triumph of simple, clever engineering over environmentally impacting heavy industry. But enough of that, the cows in the back seat are mooing and we need wine. First stop is into a huge imperious winery. As the security guard opening the imposing gates I confess to feeling a little swell of pompous privileged elevation. Safe to say that this winery is a bit of a flat start, our steroid induced human toucan of a guide is dressed in weird Brazillian pyjama pants and we are forced into a tour that consists of little other than ‘this is this, that is that’ basics. The wines here are ok but nothing to talk about so it’s a start that we know leaves only room for upward movement. The wineries here are less about the cellar door and more about a big tour so we ask the driver to insist on a very abridged tour or none at all from here on in. Apparently he’s not a fan of this winery either and confidently asserts that we’ll love the next one. Achaval Ferrer is our next stop and first impressions are spot on. It’s a boutique winery for sure but by Aussie standards not so small at all, it seems volume is the go over here. And true to form we are greeted by a passionate woman that really knows her stuff. 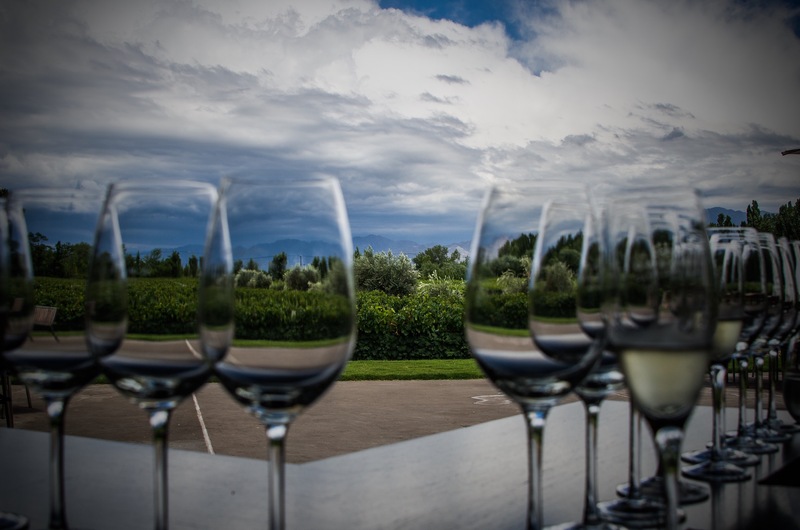 We sit outside gazing out to the rising range of the Andes capping over the vines which always seem to define pure romance for us. And these wines are the go, the hot days too much for most grapes but Mendoza definitely does do Malbec well. We get a first class introduction into the terroir and even get two tastings straight from the barrel to support the education of the barreling life cycle of the wine. We get back into the car and we can’t sing the praises enough, this is the Mendoza we came to see, authentic, passionate, romantic and delicious. Off to lunch we’re hinted to by the driver that we’ll like this one too. And I could go on, and on; and on. We are shown to an elevated dining space just high enough to give us another view just atop the fields of vines of the Casarena winery to the mountains beyond. We are indoors until the massive bay doors are drawn open to an unobstructed vista that momentarily pauses even our conversation. We’re the only ones in this most spectacular of restaurants with the girls looking a hundred bucks and nothing but our suggestive array of wine glasses to pre-empt a million dollar view. We’re light on for information but this imposing line of pristinely clean glassware can only mean one thing; degustation menu. No time to think though, we’re being poured bubbles from the get go to cheers a fantastic day that has already beaten expectations before it’s barely begun. This food is not a disappointment at all. Our cleverly designed menu walks us through the tastes of Mendoza from matching glass and plate building seductively to a simply heavenly piece of beef paired with a local malbec; a little top up is necessary. The conversation rockets along, the laughs are hearty and the definition of indulgence is rewritten. Any tourism advertiser would salivate at the completeness of this scene, this whole restaurant to ourselves with the view of views enjoying the fruits of the land, the cliche epitome of the good life. We cannot stop reminding each other about how perfect this is, we all want to close our eyes and sink into the feeling of comforting bliss that we are now surrounded by, or is that just the alcohol? There’s no denying we’re a little drunk, more than a couple of uncontrollable giggling fits grip us all in this meal of earthly delights. Floating to the car we’re off to our next stop Carmelo Patti, this day already overflowing with all things decadent but like packing a travel bag, we can always get in a little more. I think we all just don’t want it to end either. Last stop is a thankfully informal one, we stand, nay, sway to the tasting of delicious aged wine up to twenty tears old. We appreciate it all but surely miss a few notes in this state. This tasting is free which is unusual for this area so we all chip in for a sensational ’94 blend which is just heaven. If yesterday was a food coma then today we’re calling the morgue. We make plans with the girls to go out after siesta but despite all good intentions it never gets off the ground. At the start of the day we romanticised about drowning in wine and we’ve done just that. But more, we drowned in romance, vistas, food, laughs and friends. 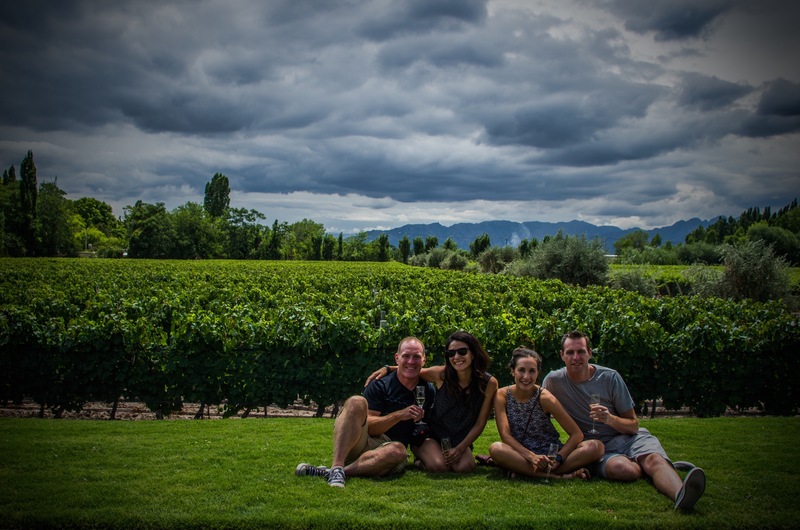 Indeed Mendoza puts more than just wine in bottles and food on plates. 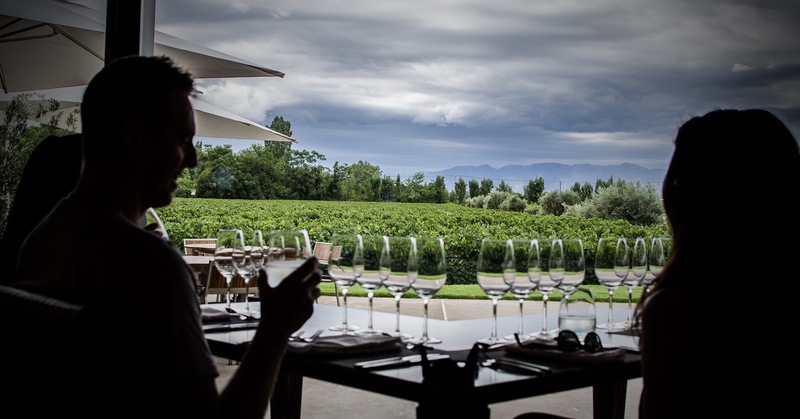 Menus and wine lists really need to have an option here of ‘the good life’, although we call it a range of different things it seems that’s what is really on sale in Mendoza.